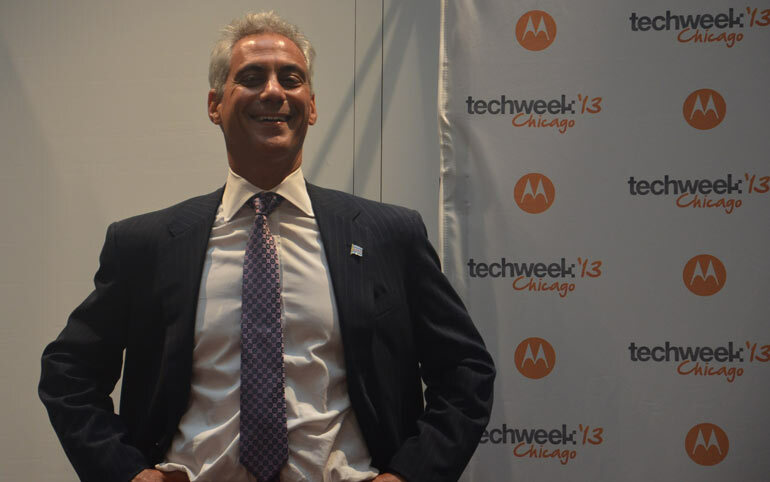 For the second year in a row Chicago Mayor Rahm Emanuel closed out day two of Chicago TechWeek, congratulating We Deliver, the winner of the TechWeek Launch startup contest. At the beginning of his remarks Emanuel congratulated TechWeek on improving the attendance and excitement of the conference, now in it’s third year. The mayor also had the chance to recognize the two people in the audience wearing Chicago Blackhawk’s jerseys. It was also “Black Hawk Day” where over 1 million Chicago area residents were in downtown Chicago for a parade to celebrate the Black Hawk’s Stanley Cup victory over the Boston Bruins. Mayor Emanuel took a minute to recognize the new Google Motorola headquarters. The company is now an anchor tenant at the Merchandise Mart building, which houses TechWeek and over 200 startups in the 1871 co-working, incubation, and acceleration space on the 12th floor. The Google Motorola headquarters is the largest build out in Chicago history since 2005 with a total of 600,000 square feet within the walls of the Merchandise Mart. When you put together the startups in the neighborhood along with the new Google Motorola headquarters there will be 8,000 employees in what Emanuel calls “the digital alley” which runs alongside the river. “8,000 employees that didn’t exist just four years ago,” Mayor Emanuel told the audience. Mayor Emanuel praised 1871, calling it a startup itself because it just turned a year old. The mayor stressed the fact that Chicago has been known for the diversity in its economy, and he feels that the digital economy is becoming a pillar in the Chicago economy. After his speech Mayor Emanuel toured the exhibit hall and even had time to play defense in a game of beer pong (with cups of water) on a C5 Beer Pong table. C5 is a Chicago startup. Check out Mayor Emanuel’s remarks in the video. Even more Chicago TechWeek Startup Coverage here.